The exact definition of a pest as shown in Wikipedia is that “it’s a plant or an animal detrimental to humans or humans concerns”, this includes organisms that cause nuisance and also epidemic diseases that are associated with high mortality, like plagues. In other words, a pest is a competitor of humanity, occurring in high densities, making the damage they do even more detrimental. 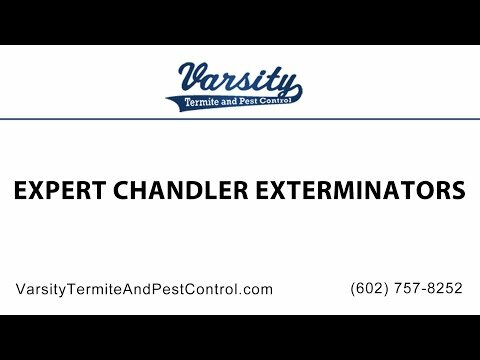 If you are located in Arizona, Varsity termite and Pest Control is the best pest control company in Chandler of choice as we take care of any type of pest you may have, including termite control and scorpion control. Give us a call if you have any questions about our services, we guarantee quality in everything that we offer. Pests are generally associated with different kinds of bugs, but it can also be other living organisms like plants or even fungus which are bothersome to humans, animals, and even human structures. Here, you will find information about the 5 most dangerous pest that can invade and populate your home. These little creatures are one of the few bugs that don’t need to sleep, meaning they are able to work 24 hours every day of the week, making them one of the worse pests you can have in your home. You need to seek Chandler pest control for termites as soon as possible since they can damage the integrity of your structure; more if it is made of wood. As we mention in other of our blog posts, termites feed from the cellulose located in wood, and that is the reason they will chew everything made of this material that is located in your house. It is considered a serious safety issue because a solid wood structure can turn weak and brittle. After wood, termites will look for paper, drywall and even books. Please contact a pest control company for termite control in Chandler as soon as quickly as you can. Scorpions like to live in dry and desert areas, making them really common in Arizona. You have to be careful of them as they are so small, they can access any room in your house that is not properly sealed for bug intrusion. They are most known for their stinger located on their back that they use to apply venom to their prey or to defend themselves. Don’t worry too much about their venom, a scorpion’s sting can hurt but it is usually harmless to humans, unless you live in another continent that has more poisonous scorpions. If you ever find a scorpion pest, don’t hesitate to contact us for more information in scorpion control in Chandler. What can be worse than pests that can live in dark, underground areas? Well, when you get one of the pests that can fly, it will surely be more of an annoyance. These little flying insects are known for being near fruit trees and flowers. They make their nests usually in eaves and doorframes in your house or in your garage which is a more secluded place. Some people find hard to differentiate between bees and wasps because both can give a painful sting, but wasps are naturally aggressive predators compared to bees that only attack when provoked. Remember that bees are bigger and hairier than wasps so if you end up with a slimmer flying bug, be careful as it can be a wasp ready to attack! Varsity Termite and Pest Control is a pest control company ready to help you get rid of these serious pests, we are characterized by our fast responses. Call today to hire a professional bee removal exterminator in Chandler. Ants are one of the world’s most known insect due to their popularity in school subjects, being the most popular bug to study as a kid. Queen ants live many years and are capable of having millions of babies so if you at least suspect you may have an ant pest in your house, don’t hesitate to gives us a call for a thorough inspection. According to Wikipedia ants form between 15% and 20% of the animal biomass in Earth, so chances are, some of them are in your house. Arachnids are one of those creatures that are both fascinating to know about but also creepy to look at. This 8 legged-bug makes their own silk web to catch their prey and feed themselves. They live everywhere, and we mean everywhere! Except Antarctica, it is the only place safe from spiders. Usually found in dark corners of a room, or in enough space between walls. Spiders will bite humans in self-defense so we suggest to not do a spider pest control in Chandler of your own, it is recommended to hire professionals for this job. Varsity Termite and Pest Control in Arizona has more than 20 years of experience in the business of pest control, standing behind our work with our Premium Service Guarantee. We pride on ourselves to be the absolute best when it comes to finding infestations and then using the very best methods that a pest control company can offer. Call us at our contact information to know more about our services.